What was surprising was how effective "Summer," from "The Four Seasons," sounded on Avital's mandolin . . . The restless heat of the Adagio was perhaps even better expressed by the mandolin, especially with the orchestra's very delicate accompaniment . . . Avital's mandolin gave Vivaldi's Concerto for Lute in D a shimmer of Venetian water you don't hear in the original; the Largo was quick and bittersweet . . . [Vivaldi / Mandolin Concerto]: Avital made the Largo swing and sway . . . Avital showed off his own fleet fingers on his solo encore, the Bulgarian folk dance "Bucimis." The evening closed sweetly with the Largo from Vivaldi's Flautino Concerto in C, Avital taking the solo part on the mandolin and everyone making it sound as if Venice were in the next room. Avi Avital's mandolin breathes captivating new life into Vivaldi's music . . . [Vivaldi's C major Mandolin Concerto is] given a luminous performance . . . Avital brings spark, dexterity and his signature finesse to transcriptions of the A minor Violin Concerto RV356 and the "Summer" concerto from "Le quattro stagioni", making the rapid violin figuration sound as though it were naturally conceived for mandolin. A D major Lute Concerto RV93 is performed with comparable taste and zest, as is a C major Trio Sonata . . . a lovely lyrical jeu d'esprit in the traditional Venetian song "La biondina in gondoleta", sung by none other than Juan Diego Flórez. Accompanied by the talented and prolific Venice Baroque Orchestra, the album offers an enjoyable fifty-odd minutes of virtuoso mandolin playing . . . Avital is unquestionably a fine mandolin player, his tone sweet and fluid, his tempos well judged, neither too breakneck fast nor too maddeningly slack, and his natural affinity for the instrument always in evidence in his intonation and flexibility. I mean, the thing about Avital is that he makes Vivaldi fun again. After so many Vivaldi recordings that all sound alike, it's refreshing to hear Avital's mandolin take on things. His transcriptions are a breath of fresh air, even giving new life to that old chestnut "Summer." Favorites? I must confess to liking all of them. But I especially enjoyed the dreamy "Largos" in RV 356 and RV 318; the zesty opening "Allegro" in RV 318; the entire RV 425, . . . the lovely, delicate "Trio Sonata"; the sweet yet lusty and fanciful spirit Avital brings to the "Summer" concerto (here, you can practically feel the heat rising from the Venetian pavement in the "Adagio"); and the longing melancholy in the final song, sung by Juan Diego Florez to Avital's accompaniment. But, as I say, they all sound fresh and beautiful . . . The engineers have captured the sound of the mandolin pretty well, the instrument very clean, very clear, with excellent transient response, and they have integrated the soloist well within the context of the orchestra. His transcriptions are seamless and satisfying, betraying neither poor transfer nor performance. He includes "Summer" from "The Four Seasons", beautifully realized played . . . This is a very satisfying listen.
. . . [this] disc has a great deal of charm, much of which lies in mandolinist Avi Avital's arrangements. In addition to skilfully transcribing each work, . . . he has in most cases also reduced or altered the orchestration, and the wonderful Venice Baroque Orchestra plays with warmth, love, and no particular desire to scratch and scrape its way through the allegros . . . His reading of the A minor violin concerto from "L'estro armonico" that opens the CD is attacked energetically, and the slow movement -- a beauty -- is lyrical and sweet. The presto is fun, with the lower strings an appealing foil for the mandolin. Avital approaches Vivaldi's music as if it were classic rock, and at times it does feel like his mandolin might just burst into flames. It's thrilling stuff . . . Listen out for a special appearance by superstar tenor Juan Diego Flórez on the traditional gondolier's song which ends the album with immense style and heart.
. . . the RV356 and RV425 concertos are both three-movement works less than eight minutes in length -- but the predominantly upbeat tempos and Avital's clean, agile playing along with the lovely, light and airy accompaniment by the Venice Baroque Orchestra make for delightful listening . . . Avital is joined by tenor Juan Diego Flórez in a beautiful rendition of the traditional Venetian song "La biondina in gondoleta", which provides a lovely end to an extremely pleasant and entertaining CD.
. . . especially the Lute Concerto, RV93, and the Trio Sonata for violin and lute, RV82, sound very well in Avi Avital's transcriptions. Even the largo from the Flautino Concerto, RV433, seems comfortably at home on the mandolin . . . These are bold performances . . . ["Summer" from "The Four Seasons" is] powerfully done . . . there's a great deal to enjoy here . . . very well recorded . . .
Avital and the superb Venice Baroque Orchestra make the C major Mandolin Concerto, RV425, their own, the "pizzicato" strings and organ continuo the rich clay into which Avital carves his crisp, fluid lines. But even better is the utterly thrilling account of "Summer" from "The Four Seasons". Here, as throughout, Avital's astonishingly smooth legato playing is broken up by rapid "détaché" passages and propulsive strums that sweep through the music like electrical storms, perfectly complementing the orchestra's crisp, light string-playing and spooky "sul ponticello" effects in the slow movement. As a respite from the concertos' high drama, there's an exquisite account of the C major Trio Sonata . . . The gentle final track, where Avital and friends accompany tenor Juan Diego Flórez in the charming gondolier's song "La biondina in gondoleta", feels just right. Avital is clearly a force of nature and everything on this disc is re-thought and re-created . . . Tempi are generally on the upbeat side, with a crispness to articulation but also a delicacy. The mandolin sound works well in the lovely slow movements, whilst preserving a brightness which enables it to stand out from the other performers . . . It is clear that the other performers (Zakai, Esfahani and Sepec) all share Avital's sense of lively re-creation. The resulting textures are indeed appealing and can be highly seductive . . . Juan Diego Florez singing "La biondina in gondoleta" makes a delightful conclusion . . . [the Largo from the Flautino concerto in C major RV 443] is undoubtedly lovely with a highly seductive texture, as sustained elements are combined with the plucked textures to produce something [magical] . . . The performances are all superb, the disc would not work if they were not. Avital is clearly a virtuoso on his instrument, and combines this with a strength of personality and charm which comes out in the music, and his collaborators all go on the journey with him.
. . . [Vivaldi's music seems made to throw a spotlight on Avital's particular gifts. The concertos on this vivacious new disc] serve as vehicles for sprightly fingerwork, rhythmic buoyancy and even a touch of soul. Together with the Venice Baroque Orchestra, Avital brings out not just the technical challenges of the music, but the zesty showmanship that can bring those challenges to life. The slow movements are sweet-toned and seductive, and the fast outer movements boast an impetuous quality that keeps things from becoming predictable, even in the familiar strains of the "Summer" concerto from "The Four Seasons". As a sort of bonus encore, tenor Juan Diego Flórez shows up to deliver an alluring Venetian gondola song.
. . . Avital gives a sparkling account [of Vivaldi's Mandolin Concerto] . . . [the concerto for lute] and a trio sonata for lute and violin work well, and the fast figurations of the familiar Violin Concerto in A minor, RV 356, also suit transfer from bowing to plucking. Even the slow movement is so florid that gentle plucking creates a quasi-legato flow. Avital's fluent technique helps -- holding notes for absolutely their full length, and with smooth shifts between hand positions . . . [in the headlong finale, Avital displays] the most spectacular of his episodic acrobatics . . . "Summer" from "The Four Seasons", its sustained tremolos replacing the long-sustained original violin notes, remains admirably calm . . . Mahan Esfahani, guest continuo player, is strikingly inventive . . . A gondola song with Juan Diego Flórez provides a delightfully contrasting ending to the programme.
. . . [the mandolin's sweet, precise sound] is the ideal foil to the booming lute, harpsichord and organ on this recording. The purity of the musical line, a hallmark of Baroque compositions, is greatly enhanced by the mandolin's delicate voice, immediately inviting us to listen in closely. Avital takes some risks with the material, to better display the qualities of his beloved instrument -- and they all pay off. The sound he achieves with the Venice Baroque Orchestra is full, luxurious and mysterious -- just like Venice itself. If you have ever visited the Sinking City, you will be transported back. If you have not, consider this to be your invitation. Juan Diego Florez renders the gondolier's song in his beautiful tenor . . . The traditional high quality production values of Deutsche Grammophon recordings are present here as well.
. . . a delight . . . [at one moment, Avital] conjured a passionate strumming of sound, astonishing from such a modest looking instrument. At others his sound retreated to a tiny silvery twang, placed just so to round off a phrase with delicate tenderness. And in the rushing motoric moments in Bach's E minor Suite he showed an amazing fleet-fingered virtuosity . . . [Esfahani] made his harpsichord as spontaneous and romantic as Avital's mandolin, by bending phrases in an expressive way, and using lightning-fast changes of registration to change the instrument's colour. Most importantly, these two players have learned to breathe and move as one. In the encore, an exotic slow movement from a Vivaldi flute concerto arranged by Avital, there were numerous sensuous ornamental notes, shared between the two. The fact that often you couldn't tell who was playing what made the music even more delicious.
. . . this disc is of very high quality. Avi Avital is clearly a superb mandolin player. All of the transcriptions and arrangements testify to his creativity and musicianship . . . the whole project is good, clean fun. Deutsche Grammophon provides good sound and intelligent packaging . . . Avital certainly has great things to say regarding his instrument. 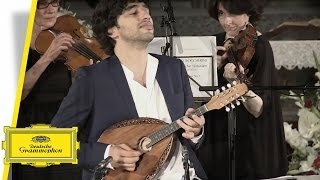 [Mandolin Concerto]: Avi Avital's playful phrasings really capture the light and experimental compositional style of Vivaldi's strangest concerto. The technical hardship of the work never occurs to us when we listen to Avital's fine ornamentation and silky scalic patterns, which ring with the trebly energy that makes the mandolin so instantly recognizable. The lute concerto is also offered on this disc, which is a pleasing reworking of a classic, and Avital does it great justice . . . Avital's playful, eccentric genius can truly shine out. I cannot emphasize enough -- this CD [is the most skilful, compelling, and sophisticated mandolin performance of Vivaldi going] . . . Avital's Vivaldi is an absolutely stunning portrait of a Venetian master . . . This CD is not only beautifully produced, with elegant cover work and an insightful information booklet, but the music is simply magisterial. I have listened to it constantly for weeks. It cannot come highly recommended enough. [Mandolin Concerto]: Avital's playing is without fault, and he moves easily from somber largo tempi to lively allegros with long runs of 16th notes . . . ["L'estate" from "Le quattro stagioni"]: His emotionally dynamic interpretation provides a refreshing new reference for this iconic work . . . ["La biondina in gondoleta"]: To me, this is the highlight of the set. If you close your eyes, you can almost smell the saltwater and hear the lapping of little waves as your gondolier sings emotionally of a lost love, while the tower of San Marco recedes in the distance. Good stuff. Mit seiner Musik macht er hörbar, dass sich viele Stücke hervorragend für die Mandoline arrangieren lassen . . . [Avital] zeigt, wie wunderbar dieses filigrane Instrument klingen kann, wenn man es nur richtig zu zupfen vermag. So lässt sich die Musik des barocken Meisters gerne neu entdecken. Schon erstaunlich, was Avi Avital mit seiner Mandoline alles anzustellen vermag. Gezupft wie gesprungen wird ihm sein Instrument gar zur Geigenkonkurrenz, am beeindruckendsten als "Sommer"-Solist in den "Vier Jahreszeiten". Es gibt Mandolinenspieler, und es gibt Avi Avital. Der 36-jährige Israeli hat das Saiteninstrument aus der Folklore-Ecke hervorgezupft und spielt darauf so virtuos wie die alten Meister der Barockzeit. Sein neues Album "Vivaldi" . . . [ist] immer so frisch und lebendig gespielt, dass selbst ein alter Hut wie der "Sommer" aus den "Vier Jahreszeiten" klingt, als ob Avital dem Komponisten die Notenblätter gerade erst vom Tisch gezogen hätte.
. . . stilvoll-mitreißend . . .
Mandolinist Avi Avital demonstriert, was man alles mit Vivaldis Musik machen kann . . . [er sucht sich] den langsamen Satz des Flautino-Konzerts dazu aus, in eine wunderschöne Kristall-Miniatur verwandelt zu werden.
. . . Avital ist zweifellos ein großer Klangzauberer, zumal in den langsamen Sätzen. Der 36-jährige Israeli hat das Saiteninstrument aus der Folklore-Ecke hervorgezupft und spielt darauf so virtuos wie die alten Meister der Barockzeit. Les notions de délicatesse et de bon goût viennent immédiatement à l'esprit en savourant les lignes mélodiques virevoltantes du RV 82, abordé en formation de chambre, comme celles, simplement élégantes, du Largo du RV 93. La virtuosité époustouflante dans les solos de l'Opus 3 no. 6 (RV 356) pour violon, comme dans le finale de "L'Eté", transcrits sans dénaturer l'écriture vivaldienne, confirme sa réputation en rien usurpée. Le Venice Baroque, impliqué et conquis, ne s'y trompe pas. Le ténor Juan Diego Flórez, en gondolier énamouré entonnant devant une jolie bonde endormie un air traditionnel vénitien sur gratouillis de mandoline, conclut sur un clin d'oeil ce récital irrésistible.